can help you survive and prosper in an age of constant change. As any chess player, military strategist, or athlete can tell you, being anticipatory gives you great competitive advantage. But what is the secret to developing anticipatory prowess, and how do you use it to gain strategic advantage? These are key questions that all organizations face, whether businesses, schools, government agencies, or community groups. In a complex and rapidly changing society, being anticipatory and gaining strategic advantage requires sophisticated intelligence-gathering techniques, new models of decision making, and ways to judge the results. Collectively, these tools allow you to identify new opportunities, avoid being blindsided by external forces, and to turn potential threats into opportunities. Failure to anticipate can be deadly: Your community is overrun with subdivisions and shopping malls with no concern for citizen well-being, and you organize only after it is too late. A competitor anticipates customer wants and overruns your territory, gobbling market share: Checkmate. Even big organizations with considerable internal resources have failed to anticipate dramatic outside shifts and have faced the unanticipated checkmate. For example, GM failed to heed signals in the late 1960s of a potential energy crisis, as well as the increasing attractiveness of small, fuel-efficient Japanese cars. Ignoring these signals cost GM almost 30% of its U.S. market share. Sears in the 1970s continued to "fiddle" with self-branded merchandise, monolithic department stores, and catalog delivery systems, while customers asked for name-brand merchandise and for more quality in products and services. Change has become the essence of management, so to survive and prosper in the future, you and your organization will have to perfect "outside-in" thinking skills: to relate information about developments in the external world to what is going on internally. The bottom line is whether change occurs as a series of crises or you use foresight and anticipation to manage change in a calm, informed, and systematic manner. The purpose of this article is to describe anticipatory management tools and processes that you can use to anticipate change and shape the future of your team, company, or community. One way to understand what's going on outside the organization and use that understanding to make better decisions and plans is to follow the Anticipatory Management Decision Process Model (see Figure 1). This "outside-in" intelligence flow chart has been used with great success in a variety of corporate settings--from United Airlines to Royal Dutch Shell to McDonald's. In 1983, for example, McDonald's undertook the largest toy recall ever, yet it went largely unnoticed by the public. The company discovered that one of the toys it planned to promote had a possible choking hazard. McDonald's promptly recalled the product, avoiding potential disaster. The decision process model focuses on uncovering emerging issues and gives you a way to evaluate how serious those issues are and what impact they may have on your organization, so you can make decisions in time. The first step is to identify emerging issues before they strike, much like earthquake forecasters scan fault lines for signs of abnormal activity. Because significant issues may emerge from unexpected places, it is important to scan the macroenvironment for social, technological, economic, environmental, and political developments. Anything can happen in any of these sectors to change the future, such as an oil embargo, a wave of immigration, or a new zoning ordinance. Trends and events converge to create issues, such as environmental protection, product liability, energy availability, and technostress. Scanning, monitoring, and forecasting. Scanning identifies signals of change and monitoring follows these signals. The onset of lawsuits and legislation surrounding repetitive stress injuries was signaled loud and clear by over 1,200 newspaper and magazine articles on the topic in 1993. Some organizations paid attention and prepared, and others ended up in the courtroom. Next comes forecasting, which estimates the duration, direction, acceleration, and amplitude of the signals. Challenging assumptions. We all have certain assumptions about our organization and the world. These assumptions develop over time and become filters, keeping out information that doesn't fit. For example, members of a school board may believe that "the Internet is just a fad." A few of the critical implicit assumptions held by the U.S. automobile industry in the 1970s included: "The American car market is isolated from the rest of the world," "Energy will always be cheap and abundant," and "The consumer movement does not represent the concerns of a significant portion of the American public." By the mid-1970s, such assumptions were beginning to lose their validity, but it took the Big Three 20 years to recognize it. That school board could face a similar lesson regarding the Internet. Conducting issue vulnerability audits. What are the subtle, overlooked opportunities or threats that fall outside your organization's normal sphere of activity? Audit your organization's vulnerability to change and disruption that may result from new competitors, new regulations, special-interest-group initiatives, scientific discoveries, or media disclosures. Such an audit will increase your awareness of and sensitivity to external forces. It can assist you in surfacing strategic issues before they become critical and your opportunities for acting are constrained. Writing scenarios. The purpose of scenarios is to illuminate uncertainty. Scenarios help determine the ramifications of an issue's development along several alternative paths, which enables you to examine an issue's implications over time. If an organization, for example, is thinking of expanding overseas, it should consider scenarios of political risk for the countries it is targeting, such as a revolution or currency devaluation. The next stage in the Anticipatory Management Decision Process Model is to analyze the intelligence you now have about issues that could affect your organization. An issue brief is a concise document that summarizes an issue for your leadership's consideration. 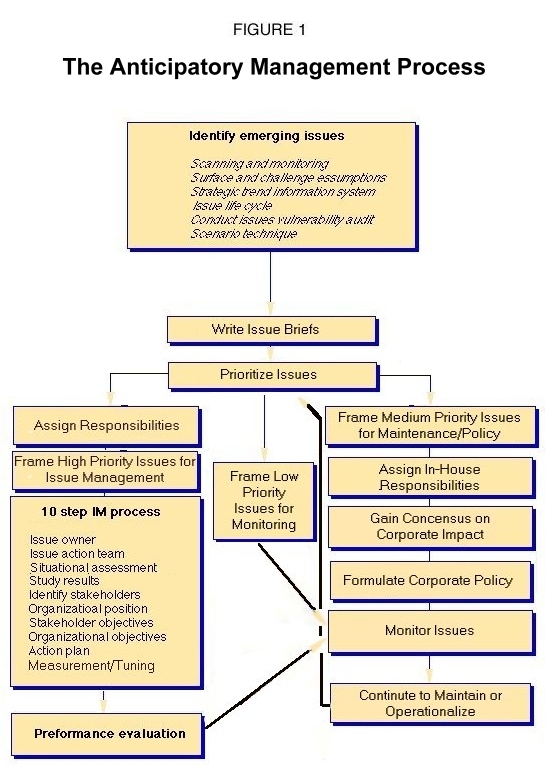 A typical issue brief (about two pages) contains a statement of the focus of the issue; a discussion of its background; a description of the trends, driving forces, and people and groups with a potential interest in it; a forecast describing its future prospects; and the potential implications for the organization. In the next stage, you must address crucial questions: What is the probability that the issue will become critical? What is the probability that it will affect the organization? Can or should the organization influence the issue? Issues must then be prioritized based on whether they require an immediate action or simply should be monitored and periodically revisited. For example, the failed safety inspection of half the county's bridges demands action, while lapses in mowing roadside grass can be dealt with later. After your group has taken an action on a high-priority issue, you must review how well the action plan was implemented, whether objectives were attained, and how the people and groups involved have responded. Sara Lee's response to repetitive stress disorder is a classic example of how to effectively manage an issue. Rather than dismissing employees' complaints about repetitive stress, Sara Lee hired a physician to observe the workers and make recommendations. The company also hired an ergonomics engineer to evaluate the assembly line. Recommendations from the doctor and the engineer were put into action and complaints of repetitive stress decreased 80%. It is important to remember that an issue may be in its emergent stage for your organization, but it may be much further progressed for another. Look for other organizations that may have already considered the issue. They may have valuable information that you can draw upon. For example, when United Airlines confronted the issue of radiation from video display terminals in 1983, their review of companies outside the airline industry uncovered information that made policy formation much easier. The anticipatory issues management team used this existing information to draft position papers, form coalitions, and write testimony. The lead time allowed concerns to be shared and addressed. Ergonomic architects were brought in to evaluate each reservations center and accomplish the necessary work on United's time and budget rather than a government-imposed time and budget. It is important to understand how strategic information flows from outside to inside your organization. Otherwise, you may find yourself befuddled by an issue for which ample information already exists somewhere in the organization. A sports trainer may know that the star player has a degenerative back condition, but if he or she does not tell the coach, the team may suffer when the condition becomes serious later on. In the late 1980s, Motorola had an enormous amount of information about the relationship between cellular phones and possible neurological damage. But the company did not use the information to manage this potential issue. Instead, an outsider presented the case for a positive link between the two and set off a somewhat hysterical public debate, in which Motorola took a real bashing. Anticipatory management relies heavily on processes and responsibilities. The decision process model described earlier helps you follow the flow of strategic intelligence through an organization and assign accountability or responsibility for responding to that intelligence. While emerging issues may be complicated, the process by which they are dealt with should not be. Assign the anticipatory management function. The title of the manager charged with the anticipatory management function varies within organizations--in business, it ranges from issues manager to public affairs manager to vice president for public relations or strategic planning. We'll use the generic term anticipatory manager. The anticipatory manager's duties are to oversee the strategic intelligence system, identify issues from numerous sources, analyze and compile trend information into issue briefs for consideration by a steering committee, and facilitate action and policy teams. Form a steering committee. The steering committee is made up of senior staff or volunteers selected by the leadership to screen and prioritize emerging issues that have already been identified. This team should possess an in-depth knowledge of the organization and have an open mind to the external forces with influence on the organization. Their duties are to review the issue briefs; determine implications and degree of organizational opportunity or vulnerability; rate issues on the basis of probability, impact, and whether the organization can or should influence them; and develop consensus on the degree of organizational involvement. Manage the issues. If an issue has been given a high priority, the steering committee assigns "ownership" for the issue by determining which person or group could most benefit from or be hurt by it. Ownership does not imply that work on the issue should be carried out exclusively by the "owner." The anticipatory manager works with the owner to select an action team, set an agenda, and facilitate team meetings as necessary. When possible, monitoring events and trends on a systematic basis should be the responsibility of a separate issues management staff to ensure that all necessary information will be evaluated. Inform the leadership. At this stage, the steering committee reviews the action plan presented by the issue owner, including details of what is to be done, why, by whom, when, how much it will cost, and where the money will come from. Because many action plans involve cross-disciplinary work teams, it is crucial that all parties agree to it. The steering committee then forwards the plan to the leadership, who may need to quiz the committee on such issues as the involved parties' positions and technical and operating objectives. Using the decision process and the accountability models together assures that your organization is linked to its external macroenvironment and ready to act. If your organization spends its time solving problems and resolving crises, it will have little time for innovation. The tendency to race headlong into the future while looking in the rear-view mirror (to see how something was done in the past) and out the side windows (to see how the competition is doing it) has proven unproductive over the long haul. With foresight and anticipation, your organization will be more productive. Anticipatory management provides systematic and formal ways of understanding the world outside the organization. However, anticipatory management only becomes useful when it penetrates the "inner world" or mind of the participants. The human mind works by using accumulated experience to construct an internal model of the external reality. The tools of anticipation offer important additional information about the outside world. More significantly, they fundamentally alter perceptions, challenge prejudices, and open your mind to new insights so that you and your organization will know what to do, how to do it, and what the outcome might be. William C. Ashley is an adjunct professor at Northwestern University and president of Ashley and Associates, a consulting center specializing in anticipatory management and crisis prevention techniques. E-mail WCAII@cs.com. James L. Morrison is professor emeritus at the University of North Carolina-Chapel Hill. He is author or co-author of over 200 publications focusing on educational planning and on using information technology tools in educational organizations. His e-mail address is morrison@unc.edu. Ashley, William C., and James L. Morrison, "Anticipatory Management: Tools for Better Decision Making", The Futurist, September/October 1997, 31(5), pp. 47-50, posted at DSSResources.COM, January 3, 2004. This article draws from Ashley and Morrison's book Anticipatory Management: 10 Power Tools for Achieving Excellence into the 21st Century (Issue Action Publications, 1995), which is available from the Futurist Bookstore for $29.95 ($26.95 for Society members), cat. no. B-1957. A longer version of this paper was published in the Summer 1996 issue of Futures Research Quarterly. Sarah Warner (swarner@wfs.org) provided permission to reprint this article on Monday, November 24, 2003. This article was published at DSSResources.COM on January 3, 2004.